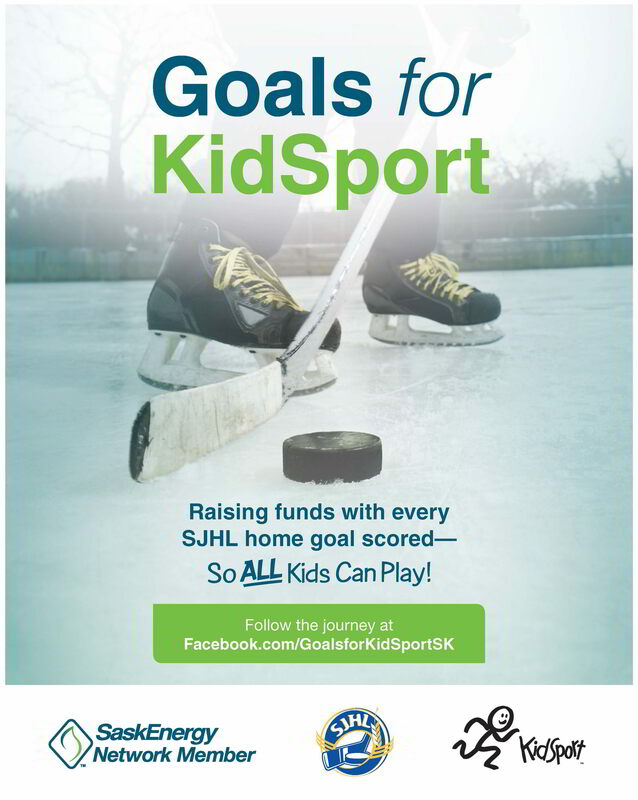 Goals for KidSport is a collaboration between SaskEnergy Network Members (independent retailers and contractors), KidSport Saskatchewan and the Saskatchewan Junior Hockey League (SJHL). The program raises funds in communities across the province to help kids access sport opportunities by reducing the financial pressure that some may face. For every home goal scored by an SJHL team (up to 1,000) during the regular season, $20 per goal is donated to local KidSport Chapters. Fri. Nov 2, 2018 7:30pm Melville Millionaires @ Humboldt Broncos Elgar Peterson Arena MNM Plumbing and Heating Inc. Sat. Nov 3, 2018 7:30pm Kindersley Klippers @ Estevan Bruins Affinity Place Mid-City Plumbing and Heating Inc.
Sun. Nov 4, 2018 4:30pm Battlefords North Stars @ Notre Dame Hounds Duncan McNeill Arena Aquarius Plumbing & Heating Ltd. Sat. Nov 17, 2018 7:30pm La Ronge Ice Wolves @ Melfort Mustangs Northern Lights Palace Main Plumbing & Heating 2010 Ltd.
Sun. Nov 18, 2018 7:30pm Melfort Mustangs @ La Ronge Ice Wolves Mel Hegland Uniplex Abben Heating & Plumbing Ltd. Sat. Dec 1, 2018 7:30pm Notre Dame Hounds @ Kindersley Klippers West Central Events Center LUK Plumbing, Heating & Electric Ltd.
Sun. Dec 16, 2018 4:00pm Nipawin Hawks @ Battlefords North Stars NB Civic Centre River City Plumbing & Heating Ltd. Sat. Feb 2, 2019 7:30pm Notre Dame Hounds @ Nipawin Hawks Centennial Arena JT Plumbing & Heating Ltd.